Learn more about StudioLive Series III Fat Channel processing. Learn more about StudioLive Series III scenes and presets. Don’t you hate it when you’re setting up for a show and find you have an unused subgroup—but you’re short one monitor mix? That’s not a problem anymore, thanks to six FlexMixes that can be individually designated as aux, subgroup, or matrix mixes. These 6 FlexMixes are in addition to the 2 internal effects sends and the stereo main bus, giving you a total of 10 mix buses, not counting the solo buses. We also provided eight Filter DCAs so you can more easily and flexibly control groups of channels. These are only a few of the many ways you can customize your StudioLive Series III rack mixer exactly to your needs and workflow. Networking isn’t the future of professional audio systems; it’s here now. StudioLive 16R Series III rack mixers come equipped with an AVB Ethernet connection that enables you to network multiple StudioLive Series III mixers and compatible computers and stream up to 32 channels of audio to and from a Mac or Windows PC. You also get 18x18 recording via USB 2.0, giving you a choice of computer recording methods. Each channel can independently access its analog input or its dedicated digital return from your computer. Alternatively, quickly and easily record the main mix—or any other stereo mix—to the built-in SD Card recorder. Upload a show for fans, give the band a reference recording, and more, no computer required. You can even simultaneously multitrack record to your laptop via USB or AVB and record in stereo to SD. Learn more about the built-in stereo SD recorder. We kept the StudioLive Series III rack mixers’ front and rear panels clean and simple, yet they have all the connections you need. 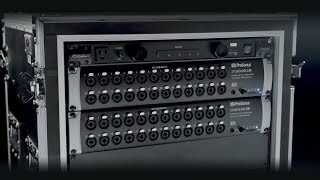 All 16 channel inputs on the StudioLive 16R use locking combo jacks to accept microphone- or line-level signals. You also get a pair of unbalanced RCA jacks as additional inputs for Channels 15 and 16 for easy connectivity to smartphones, media players, and other consumer audio sources. In addition to main L/R outputs and headphone jack, you get six FlexMix outputs that can each be independently configured as subgroups, monitor outputs, or matrix outputs. The result is a versatile set of connections that provide the access you need in a compact, 1U package.